Will Pat Gallaher close Debri2 out like he did its predecessor? We'll all find out soon enough, Debri2 premiers this Friday. Until then, enjoy this bump to bar hotline filmed by Pete Spooner on their "Pizza Pimps do Portland" trip. VILLAGE PSYCHIC: Pat, what’s up man? PAT GALLAHER: Not too much, hanging in Arizona at the moment. VP: Sick, we got some questions we wanna ask you, are you ready? VP: Who did you grow up skating with? 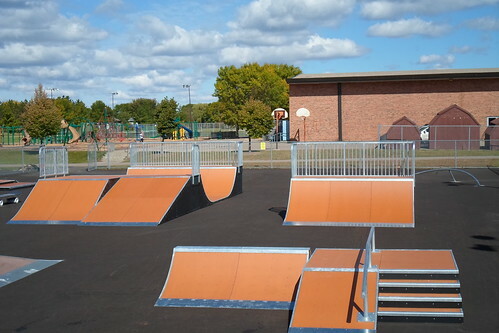 PG: I started around 8th grade with my brother Timmy (Editors note: Timmy rips too) skating the Chanhassen skatepark. I started going to 3rd Lair skatepark in the Winter and I became good friends with Dan Narloch, Neil Shipe and Davis Torgerson. We skated together all the time and started making videos (MySkate, Boondoggle). We were all at about the same skill level, but Davis started improving really fast, it was so crazy to watch. By the time we finished Boondoggle, he was on the next plateau as far as skill levels. If you think of skills as a mountain with plateaus and areas where you are skating better, or like the ups and downs, Davis was a few plateaus ahead of everyone after Boondoggle. Pat jumps this trash can while skating switch. VP: A lot of your close friends have moved to California, have you ever thought about moving? PG: I used to think about it a lot. I spent some winters in LA, but I like having Minnesota as my home base. I feel like in LA there's always a 'hot spot'. It’ll just be people one upping each other with bangers at that spot for a while, and then it is onto the next one. That’s just not what I’m into. I also love Minnesota in the Spring, Summer and Fall. I don’t mind being a snow bird. "I feel like you need to have a shop sponsor thats giving you connections or like…. How do you do it? I mean, if you know how to get sponsored, let me know"
VP: Have you ever pursued sponsors? It just seems crazy that a dude as productive as yourself buys product. PG: I don’t know dude, I’m not really an industry dude, I guess. I don’t really know how to explain it…I mean I’m down to get product, but I feel like you need to have a shop sponsor that is giving you connections or like…How do you do it? I mean, if you know how to get sponsored, let me know, haha. I do want to thank Andy Conrad for the Lakais over the years. There is actually another thing in the works, which I'm pretty excited about. VP: Yeah, what is the deal with Format? Can you tell us anything about it? PG: Format is a new board company coming out this Spring through Permanent Distribution. Permanent does Evisen, Pass~Port, Scumco & Sons, Destructo Trucks, Modus Bearings, and Broadcast Wheels. The team is myself, Aric Blattner and Chris Jata. VP: How did this come about? PG: Aric's a friend of mine. He committed to it and they were looking for more guys, so he hit me up asking if I had a board sponsor. He showed them my parts on youtube and then Kelly Williams, the guy who runs Permanent, hit me up. Pat with the Front Board, Bentley with the photo. Pete Spooner: What was up with that foundation spot in White Bear, MN all over Boondoggle? I remember I was good friends with you, I was making a video with Tim (Fulton), and you guys still wouldn’t tell me where it was. It was super exclusive. PG: We thought it would be funny to keep it a secret and make people jealous, we were in high school and still immature. It was off a street called Top street, so we called it "Top Secret". We kept it a secret the whole time even from White Bear homies. This guy from White Bear, George Akande, begged and begged, and we wouldn’t tell him, then one day, this kid Dennis Swearingen happened to be delivering a pizza to the house next to the spot and saw it and told George where it was. By then the glory days of it were pretty much over. PS: Wasn’t there a sketchy dude living in a shed by it? PG: Yeah, this guy Bob started living out of a trailer in a yard next to top secret. At first he was super nice, then he got all passive aggressive and mean and creeping us all out. That's why people stopped going there. We can't skate rails switch or fly planes :-/ But pat sure can. VP: What is the deal with your Flow Trash intro? PG: I grew up by an airport and I saw small planes flying around all the time, so I always wanted to get a private pilot certificate. Around the time of Flow Trash I finally got it. I was with Phil, Pete and Tim editing my part and we needed an intro. Someone suggested flying and it seemed right.
" Whenever someone lands something good, you just act like you have been there a while, 'there we go.'" VP: What is up with your slang? PG: I just like making up phrases and giving them a meaning. Lately we have been saying ‘there we go’ in a patronizing tone. Whenever someone lands something good, you just act like you have been there a while, 'there we go.' Calling bangers 'bingers'. The crew takes it to the next level and calls a really big banger a 'winger.' 'Scott' is a good one right now, calling your homies 'Scott' instead of dude or whatever. Scott is hot. I was trying to get this one going but it wouldn’t catch on: had to do it to em. Whenever someone does anything, ‘had to do it to em.' I think that one will catch on, it just needs a second. Say it after Scott lands a trick. I don’t know dude, the possibilities are endless. VP: I think that's a good ending.